Tresor Siamese & Balinese cats is located in Northern California, in a city called "Citrus Heights". We are less than 20 minutes away from Sacramento, Roseville, Folsom, Rocklin, Auburn, and Orangevale. We are about 35-55 minutes away from Davis, Vacaville, and Fairfield/American Canyon/Vallejo. We are about an hour and a half away from Berkeley, Napa, Oakland, and San Francisco. And we are 2 hours away from the San Jose Metro Area and surrounding cities. We are about 2 hours (or less) away from Marin,Stockton, Santa Rosa, Petaluma, Livermore, Palo Alto, Redwood City, San Mateo, San Jose, Sunnyvale, Tracy, Modesto, Saratoga, Los Gatos, and the greater bay area. We are about 3 hours away from Monterey Bay, Santa Cruz, Carmel, Redding, Chico. We are about an hour and a half or so away from Reno, and Lake Tahoe. And lastly we are located about 6-8 hours of a drive away from Los Angeles, San Diego, Santa Barbara, Santa Maria, Orange County (Southern California). C.F.A. & C.F.F Registered Cats. Kittens sold with written health guarantees, and a written sales contract. Happily breeding top quality Apple head Siamese kittens and Apple head Balinese kittens since 2003. Welcome to Tresor Siamese Cats. 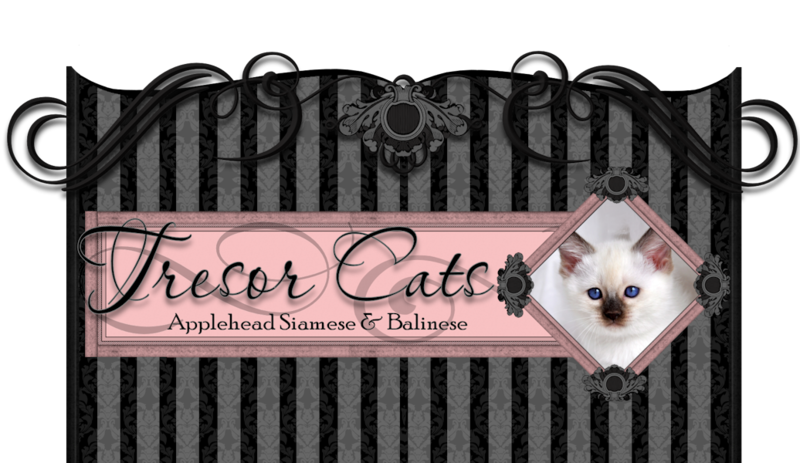 Tresor Siamese & Balinese cats is a small hobby cattery specializing in traditional style Applehead Siamese kittens and traditional style Applehead Balinese kittens. These cats types are also known as Old Style (or Thai). We are located in Northern California, and we primarily serve the Sacramento, San Francisco, San Jose, Oakland areas. Tresor Siamese & Balinese cats is T.I.C.A & CFA & CFF registered, and we are a CFA cattery of Excellence. Our Siamese and Balinese cats are tested against FeLV & FIV (negative), and we guarantee the offspring are also negative in our health contract. Our kittens are examined by our veterinarian before they are sold as pets. Our goal is to continue to breed healthy, socialized beautiful Traditional Applehead Siamese & Traditional Applehead Balinese cats for our clients. Our cat are raised indoors at all times, and we interact with them daily. It is important that these cats are treated as family members because of their highly social nature. These beautiful cats are by nature human companions, so they need a lot of social stimulation, and interaction. We not only focus on socially interacting with our cats, but we also care about their health. Our kittens are sold generally at about 12 weeks old when they have been properly litter box trained and weaned from their mothers milk. We bring them to our veterinarian for confirmation of health. Our kittens are litter box trained starting as early as 4 weeks old. We use Dr. Elsy’s Precious cat litter which is silica based, and use Natures Miracle as an alternate litter when Dr. Elsy’s is not available. When the kittens are started on litter box training we tend to use a short uncovered litter box, and once the kittens are little older they are then introduced to an average sized covered litter box. Using these two different litter boxes ensures that they will not have any litter box confusion problems when they go off to their new homes. We recommend that our clients purchase a litter additive called “kitten/cat attract” in advance for extra care in avoiding litter box confusion problems. When kittens go to a new home they need to be kept in a bedroom for the first two weeks so that they can properly de-stress and acclimate to the new home environment. This is a crucial first step when bringing them home because it greatly prevents litter box confusion problems. After their two week stay in a bedroom, they should be allowed to gradually explore the rest of the homes open areas, but should be brought back to their litter box to avoid confusion. Our kittens start weaning at 4 weeks of age. We use a special kitten glop formula their first week, and then we introduce them to our canned food ‘instinctive choice’ mixed with goats milk and vitamin powders. They always have dry food on hand (life’s abundance) for them to smell and taste during their weaning process. By the time they reach 8 weeks of age they are already eating dry food (kibble) daily and getting wet food mixed with dry as a treat about 2-3 times a week. We use NuVet Plus vitamin powder on their food from the beginning, and they leave still supplemented with the NuVet plus vitamin powder. NuVet plus vitamins are highly important to their continued immune development, as well as growth development, and this is why we have incorporated NuVet Plus into their daily regimen and extended health guarantees. We vaccinate our kittens once or twice before they leave our home. Kittens are usually vaccinated at 6-8 weeks old, with a feline distemper vaccine (3-4 way). They are de-wormed prior to leaving for not just parasites, but for protozoa control too. They are micro-chipped at 8-10 weeks old, and have their first veterinary health examination at about 11-12 weeks of age. As a professional breeder I believe that we breeders have a social and community responsibility to not add to pet over population by contractually requiring spaying and neutering of our kittens before reaching sexual maturity and by implementing strict spay and neuter guidelines. At this time, kittens will leave un-altered and must be altered (spayed/neutered) by 7 months of age by their new owners veterinarian. 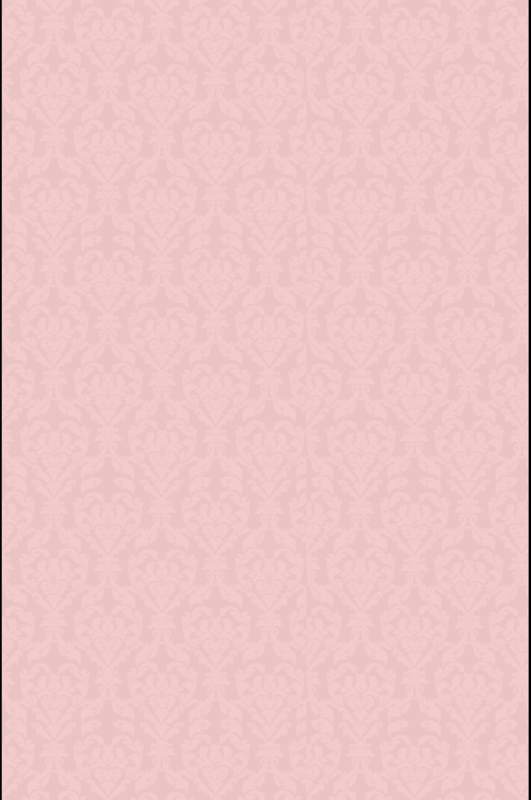 Potential clients are screened prior to accepting a deposit or selling a kitten. At Tresor Siamese & Balinese cats we not only screen our buyers to ensure a healthy home environment for our kittens but also so that we can arrange an appropriate match from kitten to owner. We ask our potential clients what they are looking for in a kitten (color point, gender, breed), and what their home routine is like. We also ask how soon they would be ready for a kitten. We give all potential clients detailed information about what our kittens come with and pricing information. Once it is established that our clients are interested in our kittens, we perform ask our clients to complete our online kitten questionnaire, which is filled with a lot of important questions about their home environment and cat care experience. We also encourage our potential clients to read our breed history information pages and our FAQ page. It is very important for us to ensure that all potential clients are responsible, and are ready for a long term commitment in owning and caring for our kittens. We reserve the right to refuse sale and service to anyone, at any given time, even if a kitten is reserved with a deposit. The kittens continue to be our property until they are paid in full and leave our home. After the screening process is satisfied, I go over deposit instructions by phone and e-mail. It is then determined if a person will be added to my waiting list for a kitten or that they reserve a currently available kitten at any given time. Once we find out what you are looking for (gender, color point, breed), we try to match you with a currently available kitten or depending on availability or client readiness we add our clients to our waiting list for Siamese or our waiting list for Balinese (or sometimes both waiting lists). We place our clients under their specific selection categories for gender, breed, color point, and then once a kitten is produced matching a clients preferences and availability based on their position on our waiting list...we then offer them such/said kitten. A client will remain on my waiting list until a kitten is found matching their preferences and available to them ...unless we continue to offer them kittens that match their preferences and they continue to refuse them. At that point we refer to our deposit policies. All deposits are “NON REFUNDABLE”, so it is absolutely important that all clients with deposits are committed to adopting a kitten from my cattery ...and not looking elsewhere. Although we primarily breed for temperaments and health, we also enjoy producing color and breed varieties. We produce Traditional Siamese & Traditional Balinese cats in the following color points: Seal Point Siamese and Seal Point Balinese, Chocolate Point Siamese and Chocolate Point Balinese, Blue Point Siamese and Blue Point Balinese, Lilac Point Siamese and Lilac Point Balinese. We are also proud to offer, Seal Lynx Point Siamese and Seal Lynx Point Balinese, Chocolate Lynx Point Siamese and Chocolate Lynx Point Balinese, Blue Lynx Point Siamese and Blue Lynx Point Balinese, Lilac Lynx Point Siamese, and Lilac Lynx Point Balinese, and White Balinese. 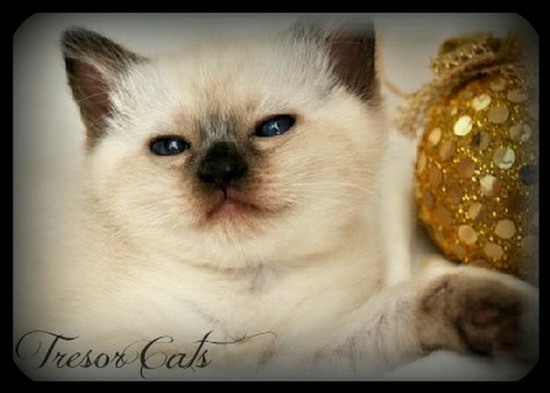 To see pictures of these beautiful Lynx Point colors visit our Snow Tiger (Lynx) History Page. Raising a healthy, and happy Siamese or Balinese kitten is of absolute importance to us. Our kittens are handled daily with great care and affection. Our children play and interact with our kittens, so it is of course vital to us that kittens leave with healthy well adjusted temperaments. We care about our kittens health and life spans. We offer a 72 hour health guarantee which means that the kitten is to be brought to a licensed veterinarian of the buyers choice within the first 72 hours that the kitten was purchased. If the kitten is found to have a genetic, congenital or hereditary defect by the buyers licensed veterinarian, then the kitten may be returned for a full pet price refund (does not include veterinary or travel fees). After the first 72 hours we offer a one year limited guarantee, or an extended guarantee of 2, 3, or 4 years covering hereditary, congenital, genetic defects. The extended guarantees correlate with keeping the kitten(s) on the NuVet Plus vitamin program for the selected extended guarantee. If the kitten dies as a the result of a genetic/hereditary/congenital defect within the health guarantee term we will offer a one time kitten replacement (terms and conditions apply), for ½ the original kittens purchase price (same breed only). No monetary refunds, nor veterinary, professional, nor travel refunds are given at any time, unless I make the exception. This is why we find vitamin supplementation (NuVet Plus) and healthy feeding to be of vital importance to our kittens immune health, and development. All of our kittens are sold “Flea Free”. We prefer to place our kittens locally, but we may consider shipping a kitten via the airlines if certain criteria is met. A shipping estimate may be provided, which will include the kittens airline flight fare, cat travel crate & dryfur padding, food/water crate clip, veterinary health certificate, and transportation fees. Feel free to contact us for further details. NEW! We are able to have our kittens hand delivered. This means that we can arrange to have the kitten driven to your home, and given to you in person. We are also able to arrange for a hand delivery person to fly with your kitten in cabin within the USA and Canada, and hand deliver to your door or meet you at the destination airport. Please inquire for an estimate on that if desired. Siamese & Balinese litters recently born. Site Updated: 4/14/2019 A.D.